In 1980, the City of Pittsburgh created the Greenways for Pittsburgh program to consolidate steeply sloped land to protect hillsides and preserve open space. Over 600 acres of greenway were created, but the program struggled with long-term stewardship. Greenways for Pittsburgh 2.0 reestablishes the program with new policies and resources. The Policy Guide assists City administrators in working with communities to build the Greenways system. The Resource Guide and Community Engagement Toolkit empower communities to take action. Greenways comprise 14% of Pittsburgh’s open space. Unlike in many cities where a greenway is a linear route like a bike path, primarily for transportation and recreation, Pittsburgh’s greenways follow the region’s topography, snaking along exposed hillsides resulting from the erosion of the Appalachian Plateau. In the City’s original 1980s greenways policy, greenways were primarily a land management and disposition tool, with an emphasis on conserving land but only lightly touching on stewardship. 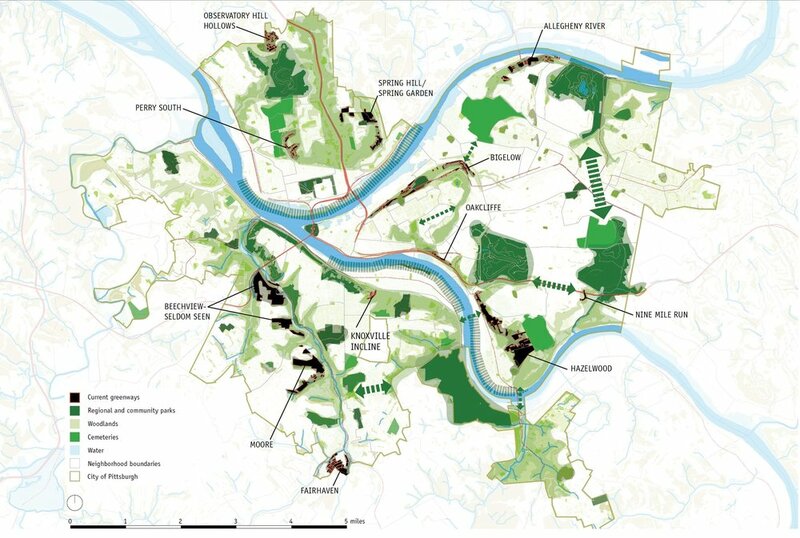 Greenways for Pittsburgh 2.0 builds on this effort, setting clear goals and expectations for how greenways are initiated, designated, implemented, and perpetually stewarded. 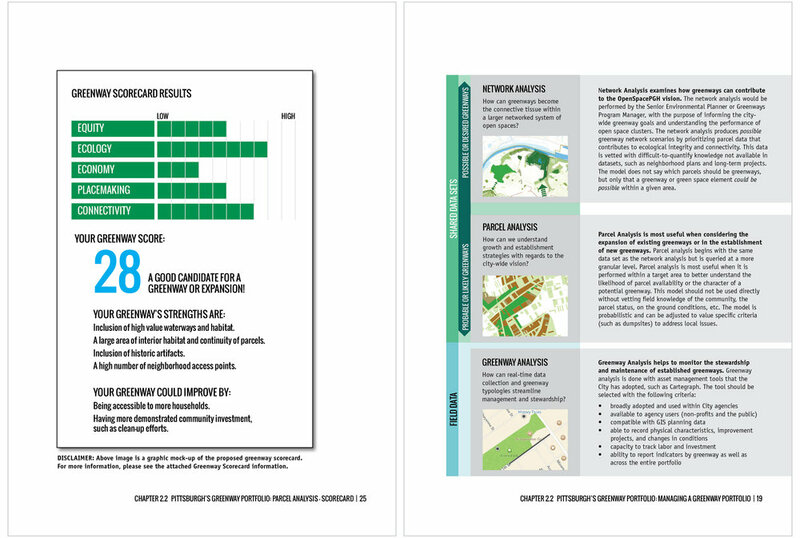 The challenge was to design Greenways 2.0 to be a robust framework that accommodates groups of varying capacity and greenways of varying types and makes room for neighborhoods to highlight their own identities while still identifying as part of the greenways system. The core of Greenways for Pittsburgh 2.0 is the re-designed greenways process, subdivided into five phases. Each phase links community members with City officials charged with the implementation of the program and identifies the goal of that phase, the application materials needed, and the review process required before moving to the next phase. 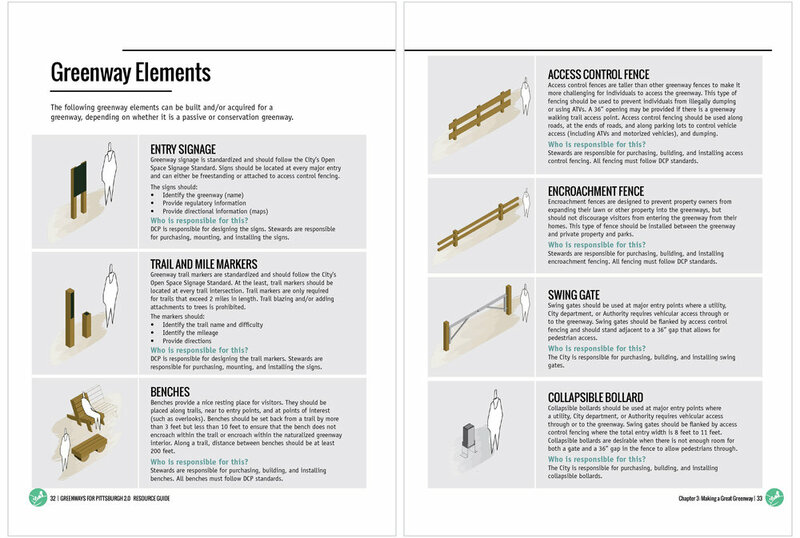 The Resource Guide explains this process to potential stewards and provides easy-to-build design standards for a few greenways elements (a bench, a fence) to make these projects more recognizable as part of a system of greenways.